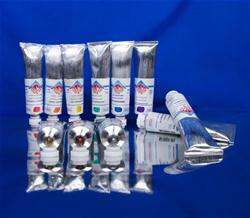 In 1998, the chemists at Old Holland started research in the area of classic acrylic paint colours and mediums. It was a long-held dream of the late owner of Old Holland, Professor Theo de Beer, to develop an acrylic paint good enough to carry the 'Old Holland' name. He called the project 'New Masters' because, as with the Old Holland oils which were used by the old masters, the Old Holland acrylic paint would be used by the new masters of art.